Male, the capital of Maldives is among the densest capitals in the world. Its main island, which is the commercial, educational, cultural and residential capital, has an area of less than 200 hectares and is home to more than a 100,000 people. Consequently, limited space, mixed land use and high-rise buildings are dominant making urban planning a tremendous challenge. Land is the most expensive commodity and therefore buildings maximize the use of their property, leaving no clearance for sidewalks. Although the island is ideal for walking because its size allows one to walk to any point in the city within 20 minutes, the Walkability Survey results found out that walking in Male’ is not a popular mode of transport. Co-organized by the Environmental Protection Agency (EPA), the Survey was conducted in June 2010 with volunteers from Villa College and EPA staff and CAI Asia Consultant. The World Health Organization’s Regional Office provided co-funding and requested that the needs of physically disabled and the elderly be taken into account. On a scale of 0-100% to measure the level of satisfaction, the overall average for Male’ was 56%. 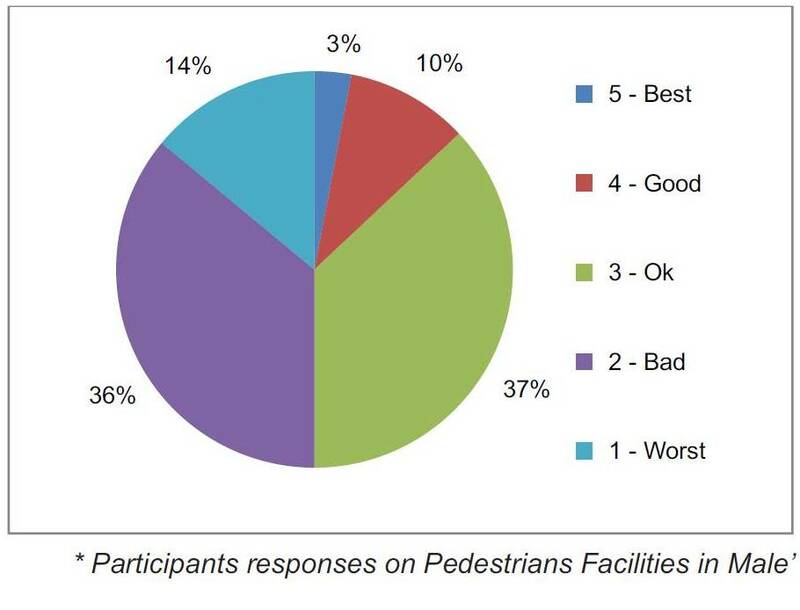 Out of the 100 people interviewed (including elderly, deaf and mute and other physically-disabled respondents), 37% rated the pedestrian facilities as “Okay”, followed closely by “Bad” at 36%. The major roads have a proportionate area devoted for sidewalks, whereas, in other areas, the roads are narrow and pedestrians have to compete with numerous cars and motorcycles. This gets worse during peak hours. Sidewalks are typically 4 inches above road level, made of bricks pavers, and the width varies from as much as 1.2m to less than 0.2m. There are several roads without sidewalks at all and pedestrians have to walk side by side with moving vehicles. There is now an over-congestion of motorcycles which is estimated to be 15,000 registered for Male’ citizens only, (in ratio, about 1 out of 6 residents own a motorbike). Unrestricted importation and the unavailability of any public transport such as buses could be the main cause of such high dependency on motorbikes. The residents have to rely on their private vehicles or the taxis (that have a fixed flagged down rate of 1.5US$ to any point in the city). There seems to be sufficient numbers of crossings, at intervals of 50 to 100 meters. On the narrow roads, it has been observed that pedestrians cross instantly instead of looking for the nearest crossing. On some crossings, the yellow paint has faded. In general, the drivers use only the allocated road and usually avoid the sidewalks. Some interviewees commented that motorists rarely gave way to pedestrians and are welcomed by honking as soon as they have to slow down or wait due to traffic. They mentioned some cases wherein some of them or their relatives have been hit by motorcycles and cars which did not stop even after the incidents. 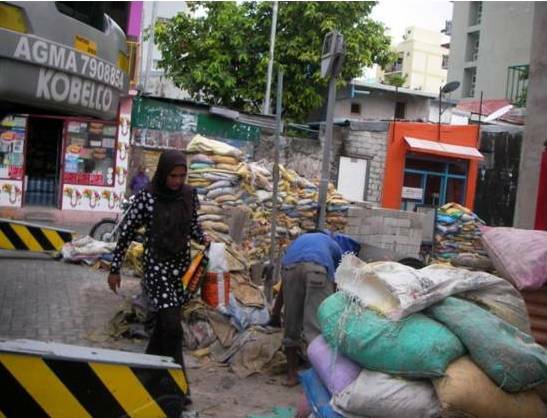 According to Indhira Gandhi Memorial Hospital (IGMH) records 155 cases of injuries to pedestrians were reported in 2009 in Male’. Of the total cases 70% of the pedestrian injuries were caused due to motorcycles, while 28% of injuries were from 4-wheelers. A few sidewalks have shade provided by trees. There are speed bumps/humps to slow down motorists. In some intersections, there are metal railings. Sufficient numbers of streetlights are available on major roads. Not all streets have signages; therefore people rely on buildings as landmarks. The available signages are written in both Dhivehi and English but the font size is very small and signages are often difficult to locate. Among the noted obstructions are construction equipment, goods and advertisements of shops and illegal parking. Not a single ramp for wheelchair access was found throughout the city. Therefore, the rating for disability infrastructure was considered the most unsatisfactory. For elderly and physically disabled, the uneven surface of the brick sidewalks is also not comfortable, while some elderly interviewees mentioned that they are unable to move out of homes due to fear of being hit by motorbikes. Furthermore, residential and institutional buildings do not have lifts which makes it troublesome for them to have an active lifestyle outdoors. The elderly interviewed were those referred by MANFAA (a local NGO dedicated to senior citizens), those met randomly on the sidewalk, those who live in the same building as the volunteers, and those jogging at the artificial beach. Disabled people are rarely on the street. CARE Society (an NGO for the disabled) referred 5 persons who consented to be interviewed at their homes, and Jamaluddin school’s special class for the deaf and mute also participated. To improve walkability in the Male’ city, stringent measures in policy, infra-structure planning and regulation needs to be in place. With such an emphasis a paradigm shift can be achieved to make Male’ a walkable city in the future. 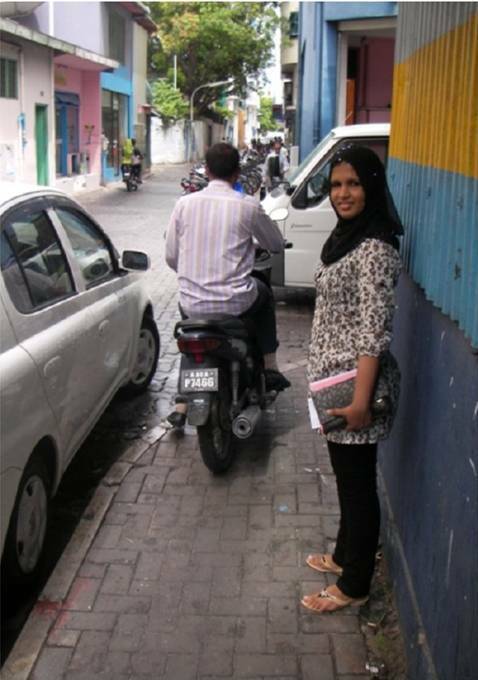 Download the report To Walk or Not To Walk: A Pedestrian’s Dilemma in Male.